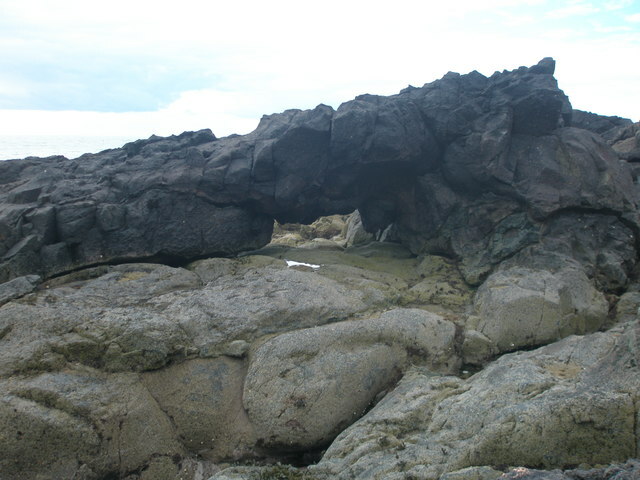 Differential erosion of lava flows has produced a natural arch in coastal rocks near Tod's Hole. NO7153 : Rock of St Skae St Skeoch Church or the "Church of Doninad" was first mentioned in the written record of 1161 when it was given by King Malcolm IV to Restenneth Priory. St Skeoch, or St Skae as it is locally pronounced, appears to have received its name from a saint of that name. The name St Skae was given to the parish and to the chapel with its burial ground at the landward end of the Rock of St Skae. At present, the Rock of St Skae is more usually known by its descriptive name of the Elephant Rock. The Church of St Skeoch seems to have been suppressed for some time as in 1576 it was written that "Sanct Skae or Dynnynund needs nae reidare". (Reader). The church appears to have been restored about 1587, as in that year Andrew Leith had "a gift for life" of 3 chalders, 12 bolls meal yearly out of the bishoprick of Brechin, for his services at the Kirks of "Marytoun, Inchbrock, Lunan and St Skae". The parishes of St Skeoch or Dunninald were united with Inchbrayock or Craig in 1618 to form the new parish of Craig. Who was St Skae? A.J. Warden, writing in 1885, said that St Skeoch, "is supposed to be one of the twelve disciples of St Columba and a northern saint. There are three saints of this name in the Irish Calendar. Dr Reeves considers the word a corruption of Echoid or Eochaidh, which is found under the name of St Skeoch in some of the south-western districts of Scotland." Norman Atkinson, Senior Services Manager for Cultural Services, Angus Council and a former Curator of Montrose Museum has informed me, in recent correspondence, that the church was dedicated to St Scaith, known as Skae or Skeoch, who was one of the three maidens of Munster. She lived in the early sixth century. There is another Scottish church or chapel dedicated to her at Bannockburn and this is mentioned by Professor Geoffrey Barrow in his book on Robert the Bruce. This Irish virgin's feast day is usually the 6'th of September, but why she was commemorated in the church by the Rock of St Skae is not known. The only ancient artefact which appears to be linked to the site was a small bone pendant with Celtic carving but this was removed from Dunninald and has never been photographed or recorded.